So you chose to replace your car tyres? Great! You could go to a garage and get any tyre they offer you. Usually, they only have a limited range of tyres and the process can take long. 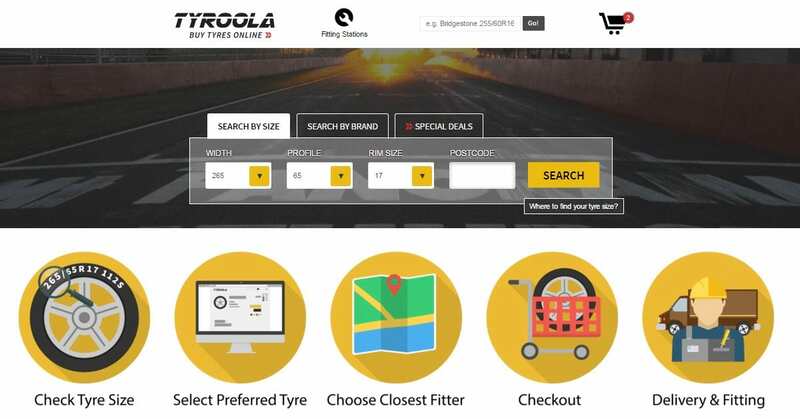 Nowadays you are also able to buy tyres online, for example at Tyroola. There are several advantages of buying your tyres online. First of all, you can choose the right tyre for your car on your laptop, phone or phone from the most comfortable place on earth - your couch at home. The process saves you a lot of time from the traditional way of getting new tyres. Since we offer the largest range of tyres in Australia including premium, value and budget tyres you can take your time and compare all the different brands (here you'll find a comparison between tyre brands in Australia) to find the model that exactly fits your needs. Make sure to check our “Buy 4 get 3” deals to not miss an opportunity getting the cheapest offer. Several certificates and previous customers prove that there is a 100% guarantee that buying tyres online at Tyroola is safe and convenient. Just follow the following quick and easy five steps. Our website guides you through the necessary steps to get the right tyres for your car within one transaction. And this is easier than ever before. Even if you have any difficulties, our customer support is there to help you as soon as possible. This graphic shows you the whole five step process of buying tyres online at Tyroola. Below you can find every step in detail, to show you exactly how to get the right tyres on your car. You need to replace your tyres when they are damaged, the minimal tread depth of 1.5 mm is reached or they are too old. You should change them at least every four years. You can find the age of your tyres as a code on the sidewall which shows the week and year they were produced. There, you will also find the tyre size. For example “205/65R17 112S”. For more information have a look at our infographics “How to read tyre codes”. You can either type the required size in the search bar on the homepage. Or you can choose to get all tyres of a specific brand like Pirelli or Bridgestone listed. Another option is to check our special deals we offer. After you selected the size you can see all the tyres we have in stock for that specific size. Feel free to have a look at each product, have a look at the different brands and compare models you are interested in. You are able to sort the results alphabetically or by price. Choose whichever tyre you like and put it in the cart. When you have chosen a tyre and put it in your cart, it’s time to get the tyres on your cars. You have two possible options: Get them delivered to your home and go to a garage of your choice to get them fitted or choose one of the garages near your home and which we partner with. To proceed and finish your order fill in your billing address, select the payment method and review your order to make sure everything is correct. After you finished the checkout, you either get the tyres delivered to your house or if you chose so to a garage. If you chose to get the tyres fitted by one of our partner garages, the fitter will contact you to arrange an appointment that suits you. You will leave this appointment with your new tyres - have fun!